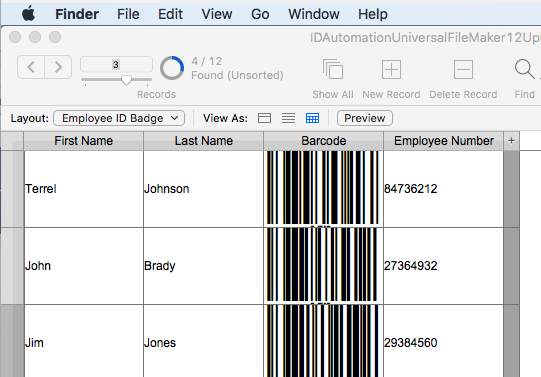 Proprietary formatting within IDAutomation’s Universal Font for Mac provides complete compatibility with all countries and locales on any device. This implementation is unique because other Code 128 fonts use extended ASCII characters (over ASCII value 126) that differ on the Mac. Cross-platform compatible with all operating systems. The package includes examples for Microsoft® Excel and FileMaker. OpenType, TrueType, PostScript and PCL font versions included. Web Fonts are also included with a purchase of any Developer License. A correct Code 128 symbol is created by combining the data that is returned from a universal font encoder with the IDAutomation’s Universal Barcode Font. Several encoders are provided that are Mac compatible including 4D, Excel, OpenOffice, Java, AppleScript, a FileMaker Pro plugin and C++ header .h files that are compatible with Xcode.